Lindsey Vonn may be an incredible skier, but she's not always practicing on the downhill. Before the ski season gets into full swing, Vonn did a victory cheer, but on the mound and not at the end of a speedy run. 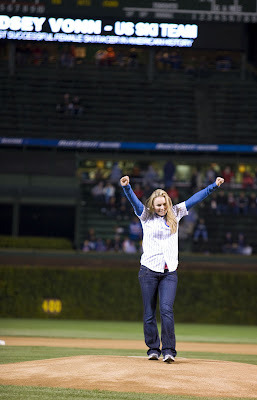 Vonn threw out the ceremonious first pitch at Wrigley Field on October 1 when the Cubs hosted the Pittsburgh Pirates. That's her above just after the pitch, and a successful one at that. Maybe Vonn can sub as a relief pitcher when she's not schussing? See a few more pictures from the night here.